Caught in the act! Mango stole a chili from the kitchen and tried to hide it under the covers. This recipe is from the Penzeys Spices magazine. 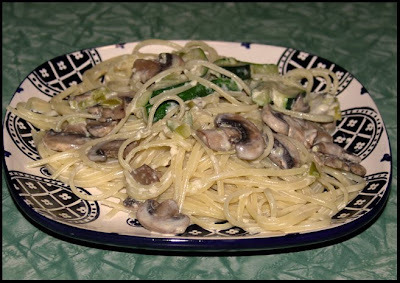 I love mushrooms and zucchini with pasta, and this is a quick, simple recipe with lots of veggies to go along with the noodles. I followed the recipe except that I left out the butter and cooked the mushrooms and zucchini in olive oil. I also used a skinny linguine instead of fettuccine. Bring a large pot of water to a boil for the fettuccine. Cook according to package directions and drain well. While the pasta is cooking, in a large skillet, heat half of the butter over medium heat. Add the mushrooms and saute until nicely browned. Add the zucchini and saute briefly, 1-2 minutes. Add the half & half and the remaining butter, cut into pieces. Bring to a boil and simmer for 3 minutes. Add the cooked pasta to the skillet along with the Parmesan and basil and mix well. Spoon into a serving bowl, sprinkle with the parsley and salt to taste and toss to combine. Serve with extra Parmesan on the side. That sounds yummy...I love mushrooms and zucchini. When I harvest my zucchini later this summer, I will have to try this one. Thanks! I hope there are some nice mushrooms and zucchinis in the market today. I can't wait to try this. That looks delicious! 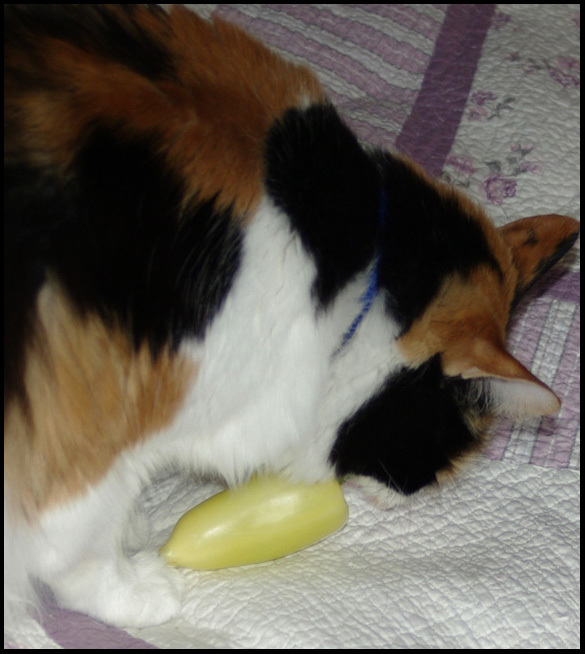 I can't believe the cat stole a chili!